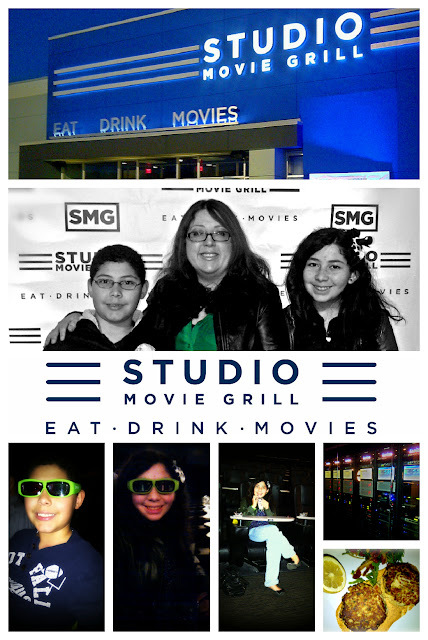 We had so much fun at the VIP opening party of Duluth Studio Movie Grill (SMG). After the ribbon cutting ceremony we went into an auditorium and ordered our courtesy appetizer, entrée and dessert while watching “Life of Pi” in their extra comfy movie seats. Studio Movie Grill, known nationwide for pioneering the in-theater dining concept has said goodbye to the days of stale popcorn and microwaved snacks and introduced a varied menu of hand-tossed gourmet pizzas, spicy Tabasco wings, a Southwest salad, and coconut chicken, alongside all of your theater favorites like hot dogs and candy. The menu also features healthier choices for adults and children alike, including turkey burgers, grilled chicken tenders, fruits and veggies. Menu prices range from $4.25 - $16.25, which is perfect for families. My favorite starter was the seared Lump Blue Crab cakes with remoulade sauce and a small salad on the side. It was dynamite. The crab was sweet, tender, and moist. It melted in your mouth like butter. For the entree we ordered the sun dried tomato + arugula artisan pizza. It comes with a very delicate thin-crust, sweet onions, sun dried tomatoes, arugula, feta cheese, balsamic glaze. The contrasting layering of flavors makes this pizza a very successful dish. The bar offers draft beers, premium wines and more than fifteen specialty cocktails including the infamous SMG Skinny Tea. There’s something to do, eat, or drink every day of the week at Studio Movie Grill. Specials such as Margarita Mondays and Beer N’ Burger Tuesdays are great ways to start the week. In addition to its first-run showings, SMG’s alternate and family programming presents additional on-screen content for SMG patrons. SMG With A Twist injects an array of additional programming including specialized series and documentaries, sports, concerts, family programming, and monthly Special Needs Screenings for special needs children and their families. SMG will also remain committed to being a good neighbor through its community outreach efforts, an important part of SMG’s ten existing locations, and a top priority in Duluth.